A dental implant is a cylindrical and/or tapered post, usually made of titanium, that serves as a substitute for the tooth root. 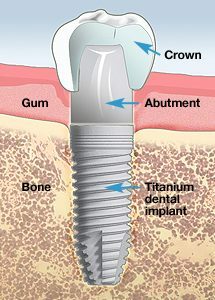 A connector, known as an abutment, is placed on, or built into, the top of the dental implant, to connect the implant to the replacement tooth or teeth. Finally, a crown, a replacement tooth, is custom made to match your natural teeth, completing the dental implant. Implants are the best option to replace missing teeth. Please schedule a consultation to know if you are a good candidate for dental implants.